A little too wordy there? Probably, but I dunno, I think it sounds kind of catchy. Moving right along…my point here is that this is the perfect recipe to transition us from summer to autumn. It’s totally healthy, but yet feels totally cozy at the same time. It’s good on a warm night, but also awesome for those first few crisp nights that will slowly be creeping in. Speaking of which, does the start of crisp nights excite you guys like they excite me? For as much as I love summer, I am also so excited for fall. Fall is without a doubt my favorite season. 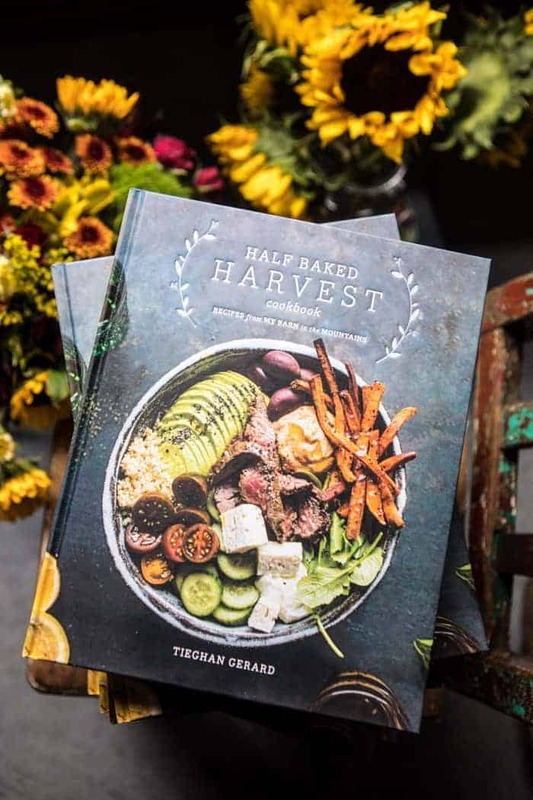 And with the Half Baked Harvest Cookbook being a fall release, I am especially excited for this coming autumn. So much to be thankful for and to be looking forward to. Now, I just need to keep saying this twenty times over in my head to block out all those other anxious feelings. Still so excited though! You guys, this book is out exactly TWO WEEKS from today! This book has been almost three years in the making, I cannot wait. If you have yet to pre-oder a copy, you can do so here. Just sayin’. Okay. Sorry. Back to this healthy casserole! Typically when I think of casseroles, I think of them as a cozy, but probably not that healthy of a meal. 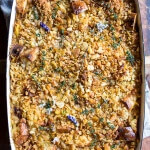 With this casserole I really wanted to create a casserole that was both cozy and healthy. 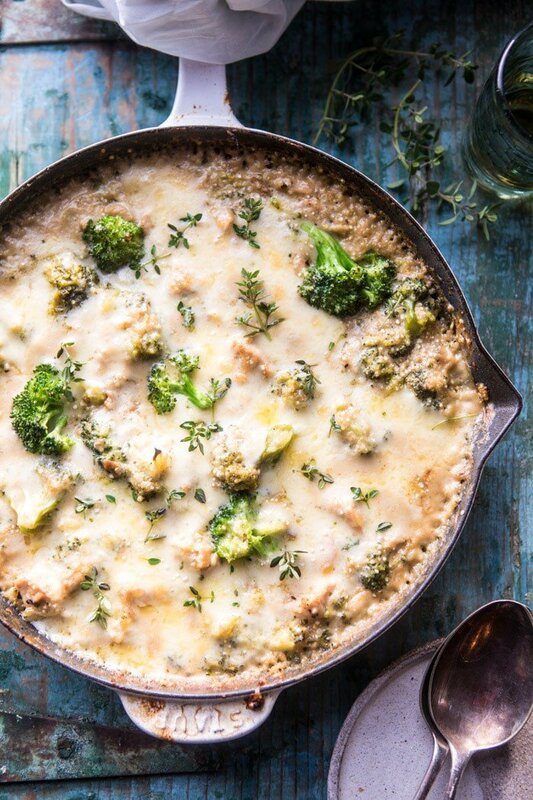 Enter this cheesy chicken broccoli quinoa casserole. 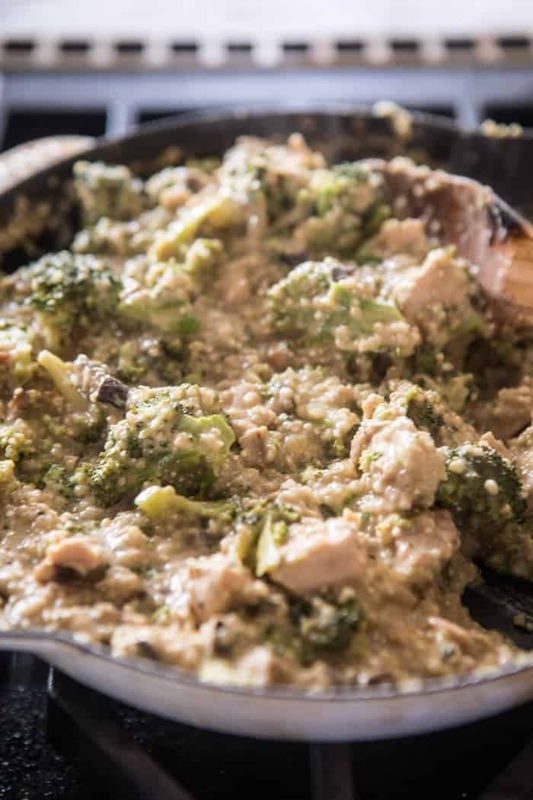 Instead of using a bunch of canned ingredients, I decided to keep the recipe simple and straight forward by using boneless chicken breasts, a little milk, chicken broth, quinoa, mushrooms, and plenty of broccoli. 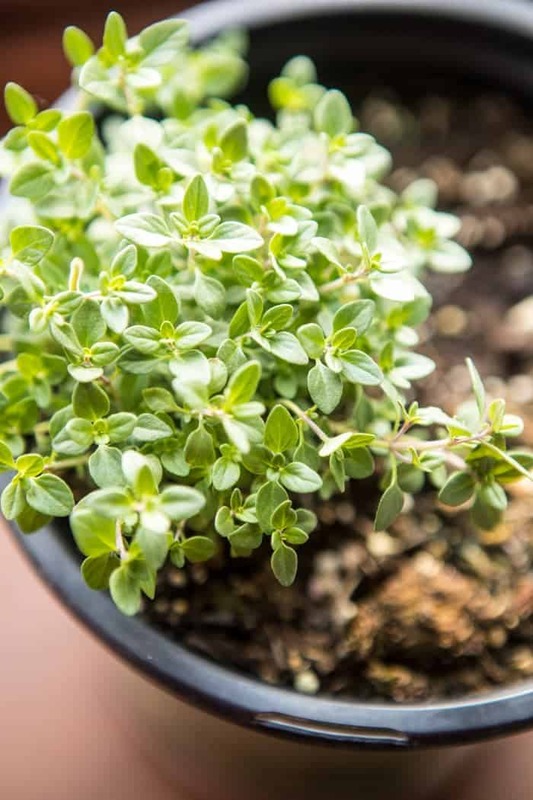 I used thyme as my flavor enhancer and just a pinch of garlic. I finished everything off with a sprinkle of cheddar (because I love the combo of broccoli and cheddar so much) and done. All (mostly) good for you ingredients, and all ingredients you may even have on hand right this second. <–hello pantry staples! One of my favorite parts about this recipe though? ONE SKILLET. Yesssss! 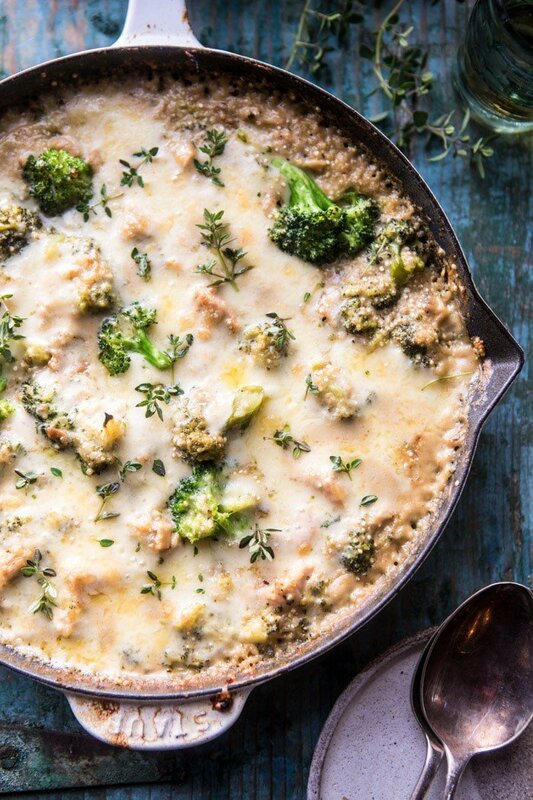 Truly nothing better than an entire dinner all made in one skillet. Just makes life, especially busy weeknight life, so much easier. I’m not sure if you guys have noticed, but I’ve been loving the skillet recipes these days, see this salmon, this peach chicken, and this grilled cheese. And lastly? This is the perfect comfort meal to make just about any day better. The real reason I made this was for my sweet mom. Since my grandma’s passing, I have been making a conscious effort to make her some of her personal favorites. 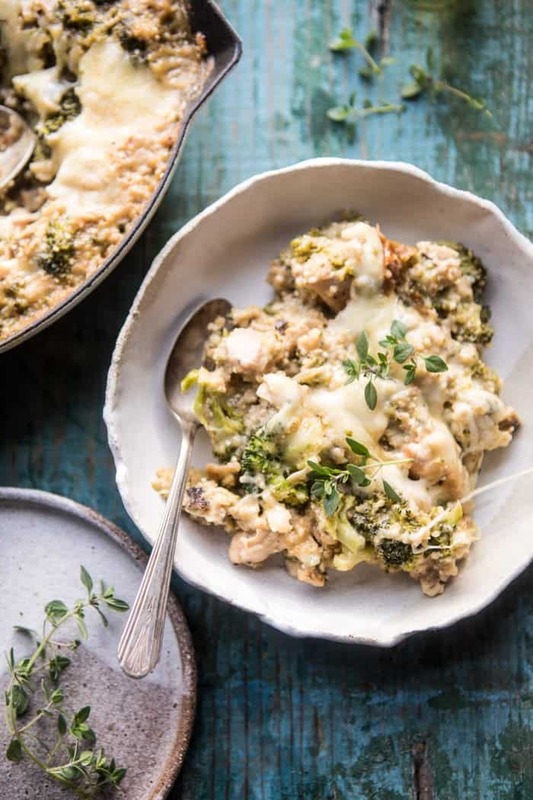 Chicken and rice, and broccoli and cheddar, are two of her all time favorites, so this casserole was really for her. 2. Heat the olive oil in a large skillet set over medium heat. When the oil shimmers, add the chicken and season with salt and pepper. Cook 8-10 minutes, stirring occasionally until the chicken is cooked through. Remove the chicken from the skillet. 3. To the skillet, add the remaining 1 tablespoon olive oil, onion, and mushrooms. Season with salt and pepper. Cook, stirring occasionally until the onion is fragrant and the mushrooms have caramelized, about 5 minutes. Stir in the flour and cook 1 minute. 4. Slowly pour in the milk and chicken broth and bring to a simmer. 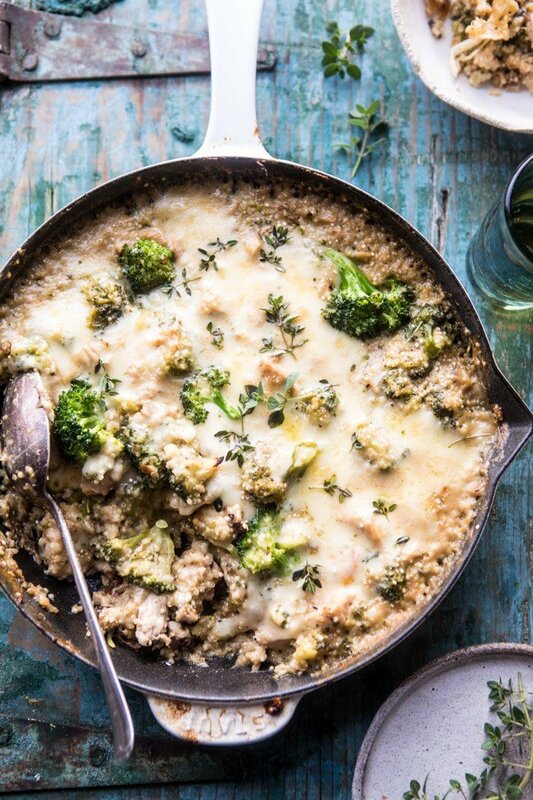 Add the quinoa, broccoli, thyme, and garlic powder. Stir back in the chicken. Reduce the heat to low, cover and cook 15-20 minutes or until the quinoa is tender. Remove from the heat and add the cheese. Transfer to the oven and broil for 2-3 minutes or until the cheese has melted. 5. Top with fresh thyme and EAT! The perfect balance of healthy…and cheesey. 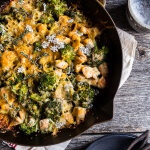 Chicken and Broccoli Skillet Bake. Yum, looks delc Ious and easy to “vegetarianize” with beans or extra veggies. What kind of skillet do you use for your skillet dinners? Time to launch HBH shop. When do you add the cooked chicken back in? I presume when you add the quinoa??? One word only for your new idea — Delicious!! It was mentioned above, but you didn’t say when to add the chicken back in. Left to my own judgment, I’ll add it after the quinoa is cooked, but before the cheese goes on. 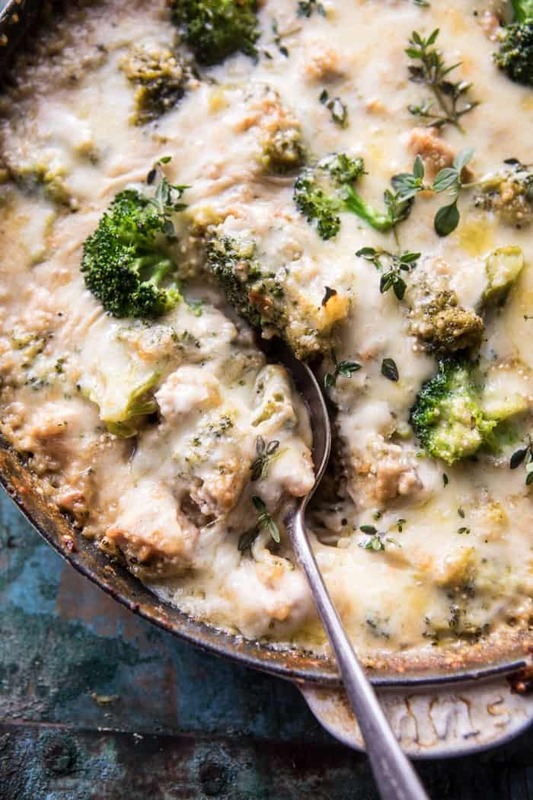 I have a chicken broccoli casserole that I make and my daughter LOVES. I’m going to try your version. It looks tasty. 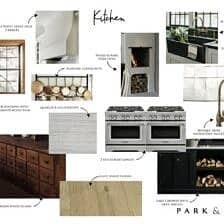 I’m looking forward to seeing the cookbook! 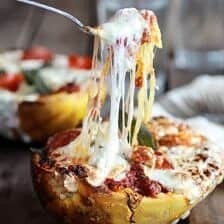 Would you suggest adding the chicken back in just before topping with the cheese etc? SO happy you like it Rachel! Thanks! Looks so good. I, too, am excited for Fall! Will be adding this to my must make list. Thanks! Thanks Karla hope you enjoy! Please read today post many have questions! Sorry Sandy! Been a bit behind! 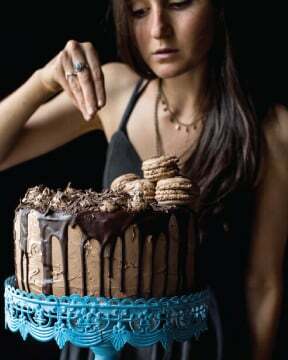 Could I use cornstarch instead of flour to make it gluten free? HI Sandy, yes cornstarch will work great. Hope you enjoy the recipe! It’s funny that you mention crisp days. We have been living in a high rise apartment in the city…which means no outdoor space and windows that open 2 inches at best. After many years of looking, we finally moved into our own place which (while still in the city) has more of a neighborhood vibe and real windows that open. It’s near the park. . .and you can actually hear birds! Imagine that. . .birds!!! We’ve been keeping the windows open and the crisp cool air has been intoxicating. Indeed the perfect weather for a hearty bowl of casserole. Loving that you made it with quinoa. AHH! That sounds like it was a much needed upgrade!! So happy for you Lynn! Hope you love the casserole! 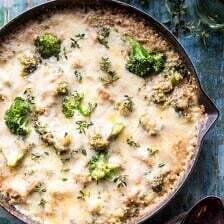 can this recipe be doubled and if so, what size skillet/pan should it be cooked in? thank you! Yes! I would use a large 12 inch skillet. Hope you love the casserole and let me know if you have other questions. Thanks! This looks fantastic. 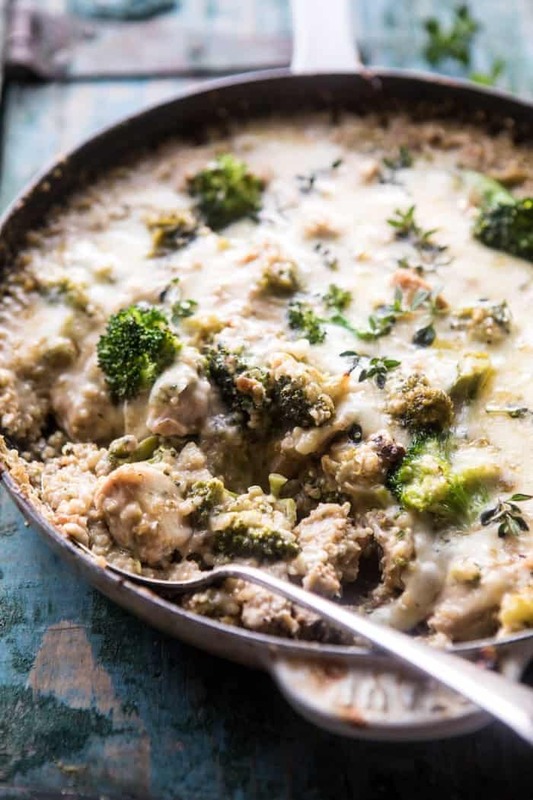 Quinoa scares me so I’m looking forward to tackling it with chicken broccoli and cheese! Thank you, Maura! I hope you love this casserole! 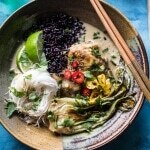 I am curently looking for recipes with quinoa and this looks delicious! Thank you! I hope you love the casserole! What a great Idea! Sounds yummy! 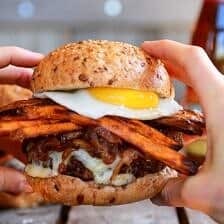 Has anyone actually made this recipe. It’s no good to hear it LOOKS good. How does it TASTE. Hey Barbara! 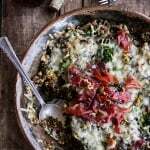 There are plenty of commenters whom have made the recipe and enjoyed it, just scroll through the comments and give them a read. Hope you love and enjoy! do you think I can sub basil for thyme?? I have SO much basil still but my thyme plant is on strike. please advise. Soooo yummy! Everything in this dish came together perfectly. I topped it off with a hickory smoked cheddar and it was bomb. I love lightened up classics with a twist like this. Awesome recipe. Thanks Libby! So happy you enjoyed it! Just made this yesterday, it was delicious. I added red pepper because I like the pop of colors in casseroles. so happy you enjoyed it! thanks! 1. Hubby doesn’t like mushrooms, so we did 3 cups broccoli instead of 2 cups broc and 1 cup mushrooms. 2. Neither of us are crazy about quinoa so I used 3/4 cups orzo. It took the full 20 minutes to cook, covered, but I stirred about 4-5 times to make sure the orzo didn’t stick to the bottom of the pan. I also kept the heat on “1” instead of just “low”. Was so hearty and delicious! I was even able to blow bubbles for my 2 year old while cooking it. So simple. Thank you again!!!!!!!!!!!! Thank you Kristen! I am really glad this worked for you and you loved it! Perfect! I hope you love it Sara! 1) If you don’t want to use milk, what could you sub in so it doesn’t compromise the flavour? 2) Can I use my Staub braiser instead of a skillet (haven’t added that to my kitchen yet) it’s the 11 inch one. I’ll be making the quantity as your recipe outlines. Hi! I would use chicken or veggie broth and yes, your Staub braiser will be great! Please let me know if you have any other questions. I hope you love this recipe. Thank you! I am so glad this turned out great for you Stephanie! Thanks! Made this over the weekend and it was delicious. Easy to throw together and very comforting. Love your recipes. Haven’t made one I don’t love yet. I am so happy this turned out amazing for you Adele! Thank you! Just made this for dinner and it was… absolutely incredible!! And that was without the thyme, because my grocery store ran out. Can’t wait to try it with the thyme next time. This was seriously so so good and easy – thank you!! I am so glad this went well for you! Thank you! Do you have any recommendations to make this dairy free while still creamy? NUtritional yeast? If so, how much and mixed with what? I don’t see what to do with the flour in the recipe? Great recipe. Comes together quickly. I use rotisserie chicken to mak this an even quicker weeknight meal. 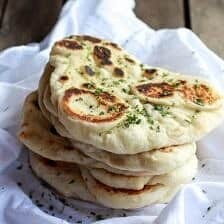 Love this website and recipes. Amazing photography! Tieghan, I made this tonight and it is so yummy, hearty, and very healthy! I added some buffalo sauce on top of my portion to give it a spicier twist and it is AMAZING. Thank you again for another home run recipe.